Looks great so far bro. That level select is badass. Thanks, I avoided implementing it because UI has been scary to make before, but once I started doing it, it was done in a few hours. Haven't played them on gamegear, It seems they're very different from genesis. Made some pixel fonts to work with these screen thingies. The tip text below flashes every other frame, which makes it hard to capture in GIF, but it kinda looks transparent in-game. Still gotta figure out a BG for the text. Thinking something similar to those in Bionic Commando. I think the running animation is missing a bit of bumping up and down, any minor vertical movement. they're basically what you're doing with most of the same influences, but old. Yup it's amazing how cohesive everything looks and man I love that mix of metroidy sci-fi with ninja gaiden gameplay. Looking forward to this. I got an idea about what to do with the running animation. Since you start out as an unskilled ninja-dog, then as you get more powers, your running animation could change to reflect your increased -ness. I found myself struggling with many animations - in terms of keeping the tweening and timing good just by feeling and nudging, so I figured I'd stick a pixel on the layers to keep track of position in a more sciencey way. I love Shatterhand, Shadow of the Ninja, Low G Man and of course Ninja Gaiden for NES. I'm very excited and you have my money day one! 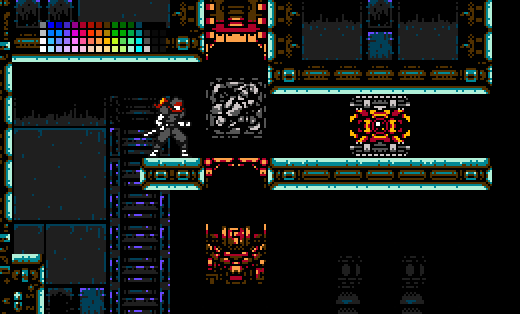 Now working on a level gimmick for the second stage. This one is going to be a combination obstacle. Ceiling unit drops hazardous waste, small hatches open for a duration before, during and after the waste drop, then a garbage muncher at the bottom "disposes" of the waste. Will try the whole thing without giving hints with animations to see if it's too hard, then maybe add some flashing lights before a drop if needed. Been tying some movements to animation frame changes instead of just moving them over time. I feel it's less slidey and more solid this way. Wow, really digging the art style on this. Glorious pixels. mesmerizing jellyfish movement, looks so much better now. This is all fantastic. Even at NES resolutions and color counts, you can spot a great artist from a mile away. Everything here looks great! Really impressed with the spider-robot, because I tried doing one myself a few years back, and couldn't wrap my head around it at all. Very clever having the fireball drag itself via it's own animation, too. Super cool stuff! The spritework and animation in this is top-notch! I come from a Commodore background rather than a Nintendo one, but I can appreciate the looks nevertheless! Good luck, and keep it up! That bullet animation is extremely cool.